A destination’s brand is made of two things: the experiences a place offers and the stories people tell about them. What if you could see everything people are saying about their experiences in your destination, positive or negative? Start with the last 1,000,000 conversations or so. New technology made to collect and measure vast swaths of online conversations is making big data analysis dreams come true for marketers. Positive word of mouth has always been important, but the Internet and social media have made it vital. Many visitors now share their experiences online and have an enormous influence on travel behaviour. Marketers can measure and analyze word of mouth through sentiment analysis to understand its impact on brand perception, and ultimately, travel decisions. But what exactly is sentiment analysis and how can it help DMOs? UPDATE: Sentiment analysis reporting is now available. Tourism Sentiment Index is currently accessible to destinations of any size and budget, but availability in this initial phase is limited. Apply now. Sentiment analysis allows destinations to measure word of mouth on a massive scale. Research has shown that word of mouth deeply affects the decisions travellers make. Networks of friends influence one another more significantly than advertising does. Yet many destinations continue to invest the bulk of their budgets on paid advertising, instead of focusing on increasing and improving word-of-mouth conversations. This new opportunity to analyze online conversations and sentiment makes word of mouth quantifiable. Marketers can gauge the impact of word of mouth on traveller decisions, giving DMOs the rationale to shift investments towards new ways of marketing. Understand what your visitors and residents are saying to make confident decisions. If you’re a regular reader, you know that Destination Think! has long advocated for listening to online conversations through social media. Many of our clients have found success by dedicating time and resources to serving their visitors online. Likewise, sentiment analysis lets organizations like DMOs measure and analyze word of mouth. Instead of assessing thousands of comments manually (not realistic), or choosing from the best and worst examples (interesting information, but hard to support a complete strategy with), marketers can now use the data to provide an accurate snapshot of positive and negative sentiment. Unlike survey data, the comments collected are unprompted and unbiased. The data is scooped from the online stream of consciousness related to destinations or products. In this way, sentiment analysis measures what people are actually saying, not what they would say, or what you have asked them to say. Software tools then use natural language processing and machine learning to help people analyze and understand patterns found in the data. To know what your visitors and residents are saying is to know your destination’s brand. Amazon CEO Jeff Bezos said, “your brand is what other people say about you when you’re not in the room,” and today’s organizations can now find out exactly what everyone is saying. 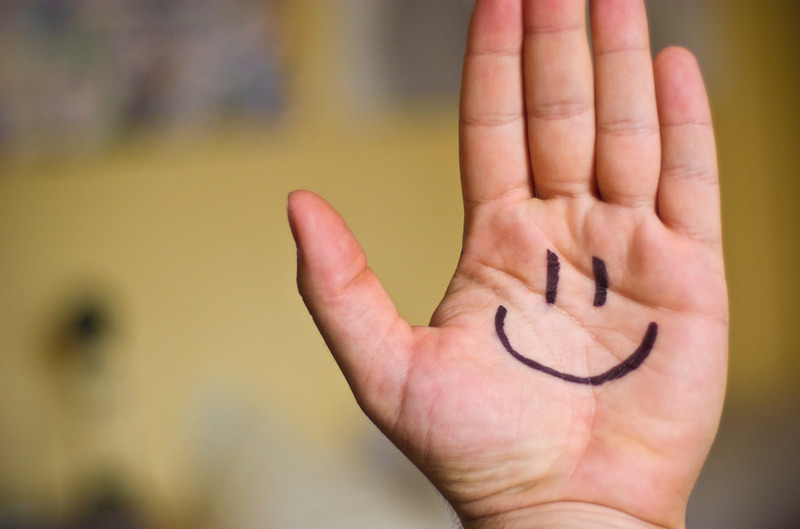 better understand the factors that lead visitors to speak positively or negatively about them. The resulting information and analysis help DMOs make informed decisions that affect everything from brand strategy and destination development to content and marketing planning. Destination Think! has used sentiment analysis to compare public perceptions of cities around the world. It allows us to gain insight into the attributes of a destination that truly make it distinct. This helps our clients better understand their competitive strengths and weaknesses in order to guide their positioning in the market. Here’s an example. Destination Think! 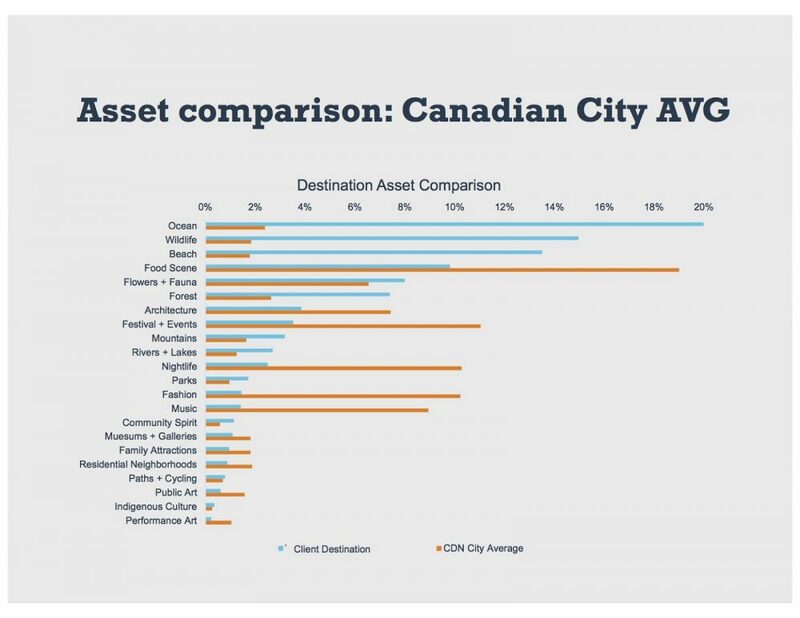 compared the volume of conversation across one destination’s assets to that of an average of Canadian cities. This context allowed us to analyze performance. For example, this destination scores higher than average on its connection to nature (ocean, wildlife, beach) and scores lower on urban elements like food, fashion, and nightlife. 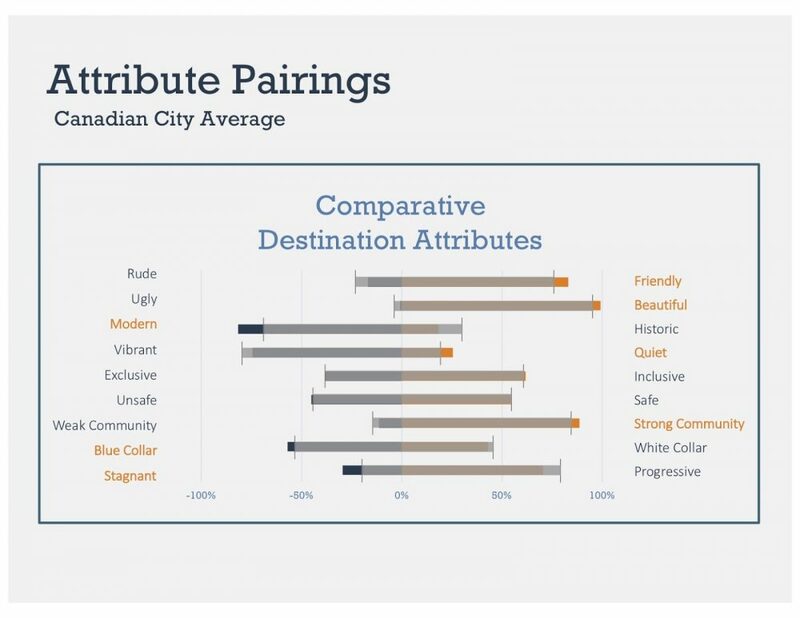 In this chart, attributes of one Canadian city are compared with the average data collected from Canadian major cities. Attributes highlighted in orange show how the city is perceived. Sentiment analysis isn’t limited to Canada, of course. Current tools can study conversations happening in or about many places around the world, in many languages. Be among the first to gain access to sentiment analysis for your DMO. Unlike typical brands or products, destinations are complex networks of people, businesses, and places. Marketers need to measure the collective with a holistic approach that is tailored for tourism. This is where your DMO comes in. Only destination marketers will be able to properly interpret and analyze destination-wide sentiment analysis in a way that is useful for strategic planning. To help, our experienced team at Destination Think! is developing a sentiment analysis framework designed specifically for DMOs. We’re combining our collective destination marketing expertise with our passion for technology and data. Our aim is to simplify big data and provide destinations with clear, actionable insights to lead their tourism industries and communities. UPDATE: Tourism Sentiment Index is currently accessible to destinations of any size and budget. This new KPI allows DMOs to measure word of mouth at scale and benchmark against competitors. Availability in this initial phase is limited. Apply now.